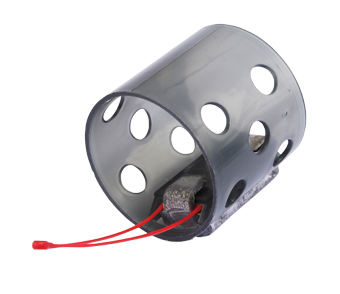 Available in light (10 gr, 15 gr, 20 gr) and heavy (20 gr, 25 gr and 30 gr) these short bodied open-enders have slightly enlarged diameters, taking good loadings for their sizes. With plenty of side weight options they cover short to medium range casting well enough. The weights are partly integrated into the plastic bodies and flattened to help prevent rolling. 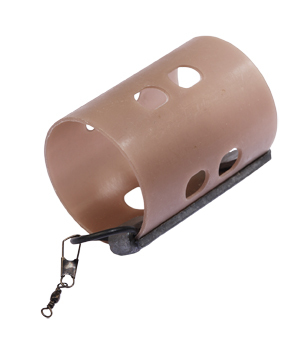 There are plenty of perforations to release groundbait and freebies quickly and these feeders are easy to tape up to get baits like chopped worm hard on the deck. The plastic links are old fashioned looking but work quite well. These tough brown open-enders have no body perforations, being designed to get live baits like squatt, maggot, caster and chopped worm hard on the bottom. Such baits can be plugged in with groundbait or mixed with it and compressed hard. Available in small, medium and large, these feeders take the same interchangeable base weights as Fox’s mesh design, giving comprehensive weight options for various casting ranges and depths of water being fished. I’m not convinced the body fins provide any advantage, the captive swivels on the moulded links are anti-tangle. Mini, small, medium and large body sizes come with up to six different loadings, ranging from 12 gr to a meaty 120 gr. This covers all groundbait applications on both stillwaters and rivers. 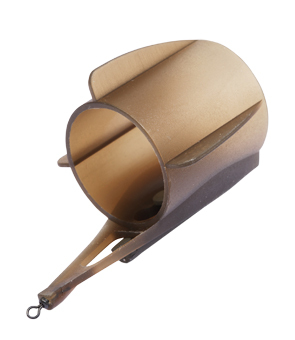 NISA’s pale brown open-end feeders are very popular with their simple strapped-on side weights, which also anchor ‘O’ ring shock absorbers and a basic swivel link attachment facility. 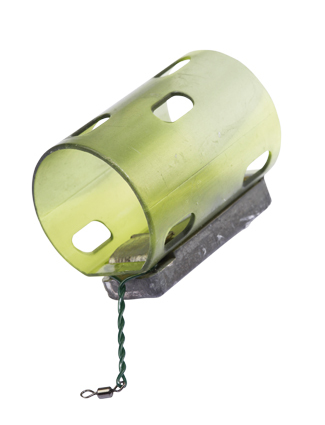 These feeders are extremely robust and allow quick changes, also providing enough weight options for each size to critically balance them, which is important in flowing water when looking for drop-back bites. 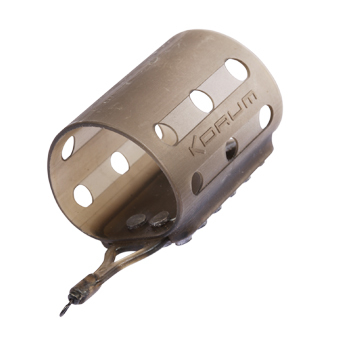 These new businesslike feeders from Korum have a slightly flattened body shape so they hug the bottom well, being combined with extra heavy side weights. Sizes are small (30 gr), medium (30 gr, 60 gr) and large (90 gr, 150 gr). This adds up to groundbait feeders suited to a positive approach when fishing deeper stillwaters and faster flowing rivers. They have slow-release perforations and neat moulded plastic links with semi-encased swivels, which help to prevent tangles. This is a very well made and designed product that immediately makes you want to give it a serious go. A classic open-end design, with simple clamped-on side leads and neat twisted powergum links – plus small swivels. The standard range offers four body sizes with 12 gr, 16 gr, 20 gr and 30 gr loadings, while there is a heavyweight range utilising the same perforated plastic bodies with 20 gr, 30 gr, 40 gr and 50 gr side weights (all 5p dearer). This covers just about every demand from stillwater to rivers. The green bodies have a slight camouflaged effect and elongated perforations for fast bait release. The side leads are easy to open up, allowing fast changes of body and leads. NOTE: All products tested January 2009. All prices correct at the time of going to Press. Angler’s Mail do not take responsibility for price or product changes or current availability.